Wagon Bow Ranch - Mohave County, AZ - Headquarters West Ltd. These are large maps (>1mb) that may take a while to download; we are also happy to send out 24"x36" prints of the map upon request. Located in southeastern Mohave County in northwestern Arizona about halfway between Phoenix and Las Vegas. Phoenix is approximately 180 miles south and Kingman, the Mohave County Seat, is 54 miles northwest. The property is accessible from U.S. Highway 93 by a county maintained dirt road. 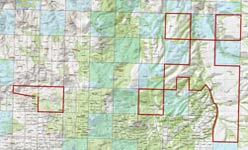 It consists of two parcels; the Parcel 1 is 20 miles west and the Parcel 2 is about 10 miles west from Highway 93. The property consists entirely of deeded land. It is the last unsubdivided block of deed land that is part of the historic Wagon Bow Ranch. The balance of the Ranch has been subdivided into basically 40 to 160 acre parcels. This property lies in two separate parcels three miles apart. 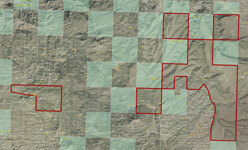 Parcel 1 lies in a checkerboard pattern with alternating sections of State Land and deeded land in the north and west sides and a block of deeded land in the middle and on the east side. Parcel 2 consists of a square 640 acre section with an irregular 228 acre extension on the northwest corner. Gonzales Canyon runs south to north through the middle of the Parcel 1 with long round to flat top ridges between moderate to steep sided arroyos and canyons running easterly into Gonzales Canyon on its east side. The topography on the west side of Gonzales Canyon is characterized as mesas and rolling hills with several canyons in the southern end of the parcel running northwesterly into Gonzales Canyon. Elevation on this parcel is from 4,000 feet in the bottom of Gonzales Canyon on the north end to 4,880 feet in the southwest corner. Vegetation on Parcel 1 is primarily open grassland with scattered areas of juniper trees and chaparral in the southwest corner and in the arroyos and canyons. Vegetation on Parcel 2 consists of chaparral with some scattered juniper trees. Water consists of several wells with windmills and dirt stock tanks. There is a domestic well at the Caretaker’s house. Improvements are minimal consisting of the Caretaker’s house, which is an 1,150 square foot modular home, the domestic well/well house and barbed wire ranch fencing. Please click here to download (about 1.8 MB) a printable brochure in Adobe Acrobat format. If you get frustrated trying to make this work on your computer, don't hesitate to ask us to mail you a printed and bound brochure instead. Headquarters West has also handled the SV Ranch just to the South and the nearby Big Sandy Ranch.